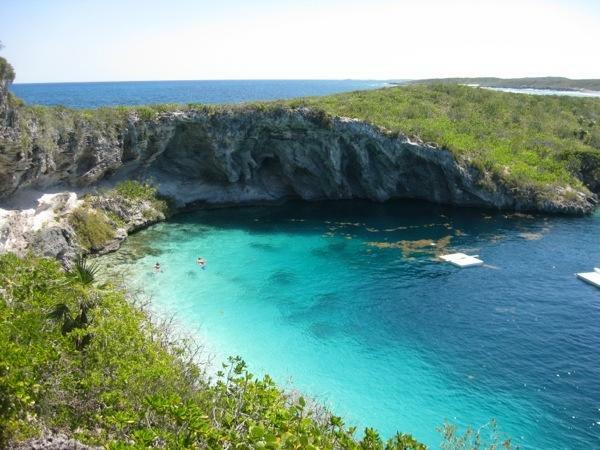 Dean’s Blue Hole – the platform you see in the center of the hole is where divers train and compete. Suit up! Time to check out this hole. 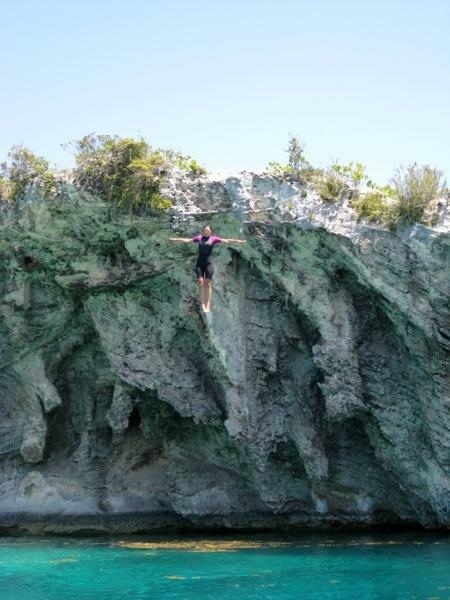 To the deepest depths and the highest heights…my brave companions took the plunge! What a fabulous day! Thanks to Ren and Ashley for giving us this opportunity. On the drive home we stopped at Forest II for the absolutely best conch burger we’ve ever eaten! Long Island just keeps getting better and better. 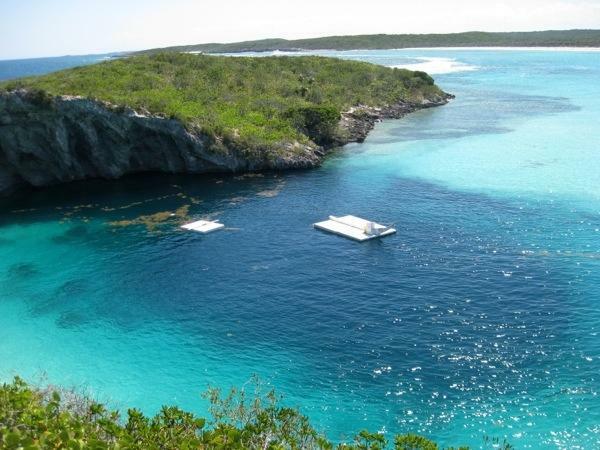 This entry was posted in Uncategorized and tagged ashley chapman, bahamas, clarence town, dean's blue hole, evolve, freediving, Long Island, ren chapman by stephanie. Bookmark the permalink. Just wondering why everyone was wearing wetsuits. Was the water really cold? LOVE that place and you BOTH!!!! thanks for sharing- on the countdown here- 17 days! But so ready to HUG my grandkids! BE safe and stay in touch! Hello Rode Trip!! We miss you two adventurous people! We have spent some of the night reading through your post’s, look’s like your having a lot of fun. Hope we can get in touch soon!! If you are into this amazing (read scary) sport of free diving, rent the movie “The Big Blue” or “Le grand bleu”, the French version which is better. One of my all time favorite movies. 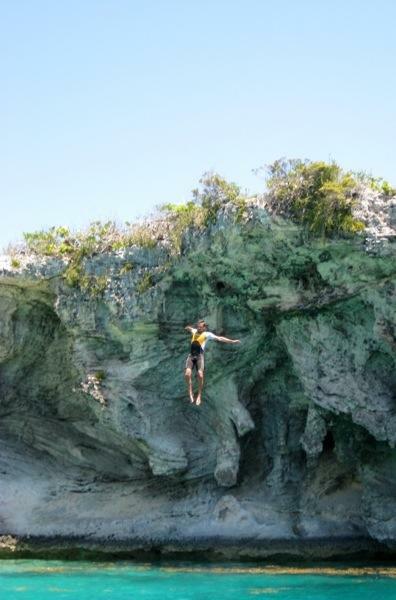 I believe some of it was filmed at Dean’s Blue Hole. Anyway, check it out. Glad you two are having a good time. 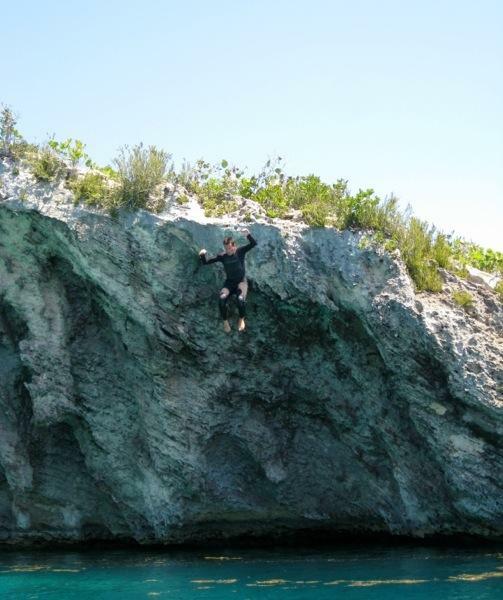 Make sure you go to Great Inagua island. It was practically owned by Morton Salt back in the “70’s…it might still be for all I know. No tourists. Brian- I’m taking the Power Squadron Piloting course at PHS. Us Laser Guys miss you. Let me know if you are going to Dominica and when, maybe I could meet up with you then. Good question…the water isn’t exactly cold, but the wet suits keep everyone cozy to be in the water for a long time. Especially the divers who spend a few hours in the water while training. 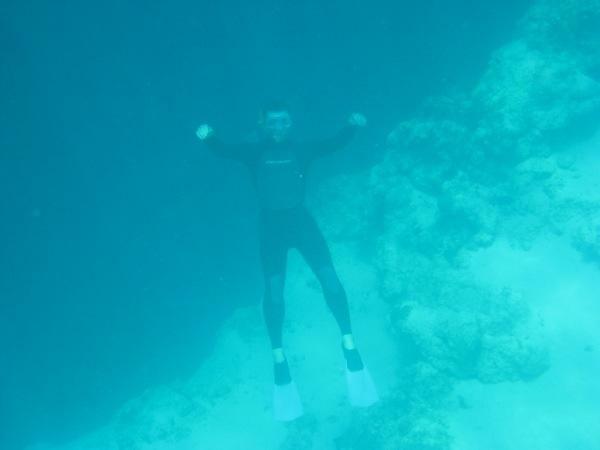 I like the wet suit also because it adds a bit of buoyancy so I can just float along and see the underwater sights. Yay! Glad you took a peek…now I can pretend you’re traveling along with us 🙂 Miss you bunches! We have been talking a lot about freediving with Ren and Ashley, and they have given me a lot of pointers on how to dive deeper to improve my spearfishing! Gives us a lot more dinner options. We will add “Le grand bleu” to our list of movies to watch. Glad to hear that you are taking the Power Squadron classes! We really liked the classes and the organization, make sure they tell you about the monthly meetings if you want to get more involved ( recruit more laser sailors from the Sail class). I miss laser racing too! All this sailing, but a cruising boat just doesn’t handle like a dinghy! Hope your Laser is coming out of winter hibernation. Great Inagua sounds really neat. What brought you there?